At the Hoffenberg and Block LLC, our Chicago high net worth divorce attorneys have many years of experience assisting clients with complex, high value marital estates to achieve a favorable division of property in a divorce. At Hoffenberg and Block, our attorneys have significant experience handling high net worth divorces and complex marital estates for clients throughout the Chicago metropolitan area, including Cook, Lake, DuPage, Will and McHenry counties in Illinois. We offer comprehensive, results-driven divorce representation that is focused on preserving our client’s assets and securing their post-divorce future. High-asset divorces can also involve the determination of value and distribution of business assets. 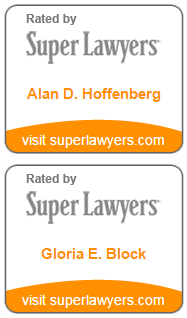 The attorneys at Hoffenberg and Block represent clients whose marital estates included professional practices, commercial businesses, financial services companies, retail enterprises, manufacturing concerns and international assets. Some assets, such as real estate, art collections, jewelry, specialty automobiles and prized antiques can have both financial and sentimental value. Our attorneys are skilled at determining the full value of these assets and making sure that our clients receive their full and equitable share. If you need legal representation for a high-asset divorce or complex marital estate in the Chicago area, including Cook, Lake, DuPage, Will and McHenry counties in Illinois, we are here to help. Call us today at 312-853-8000 or CLICK HERE to schedule a no obligation case evaluation with a knowledgeable Chicago high net worth divorce attorney.